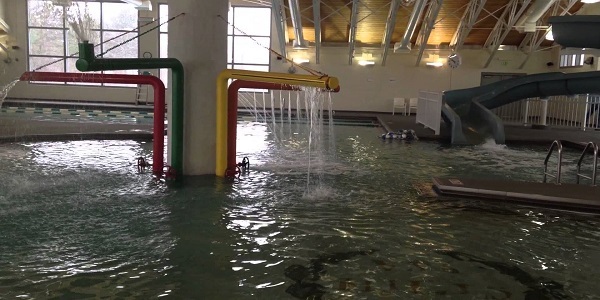 In compliance with the ADA, The Recreation Center now has a portable Aquatics Lift for members and guests. If you need assistance using the Lift, please speak with a Lifeguard or Manager. Our Pool - Click Here for the pool slide show. With a lap swimming pool, a 94-foot long water slide, 12 different water features, and 14,000 square feet of water fun, the Seven Hills Pool is the place to play. We offer programs from youth learn to swim, to lifeguard courses, water aerobics, and much more! There is plenty of time for lap and open swim, you can rent the pool for parties, or make it a great day with your family! Reserve the pool and/or room for pool parties, family gatherings, Cub Scouts, Girl Scouts, and much more! Contact Spencer Abbott at sabbott@sevenhillsohio.org. Starting February 12, 2019, SwimSations is a new and unique play-based aquatic therapy program for children with sensory processing challenges. It will provide each child the opportunity to explore new sensory experiences, while teaching water safety skills, social skills, self-regulation skills, and having fun! This program is for ages 4-8 and will be conducted on Tuesdays from 5:30 to 6:15 pm. There is a Meet and Greet/Orientation Tuesday, May 21st at 5:30 pm located at the Seven Hills Recreation Center. For questions contact Kristen Pataki at 440.567.3648 or email at kristen.pataki@gmail.com. This program is designed for ages 3 and up. We offer a variety of different skill levels from pre-school to pre-swim team. *Mondays and Wednesday Classes - Spring 1 Session: March 18-April 10, Spring Session 2: April 22nd to May 15th, Summer Session 1: June 3rd to 26th, Summer Session 2: July 8th to 31st, and Summer Session 3: August 5th to 28th. *Saturday Only Classes - Spring Session: March 30th to May 18th and Summer Session: June 8th to July 27th. *Monday through Thursday Classes - Summer Session 1: June 10th to 20th and Summer Session 2: July 8th to 18th. This program offers one-on-one or semi-private (2-3 swimmers of equal ability level) swim lessons for children & adults. The emphasis can be for learning to swim or improving stroke technique. This program is designed for swimmers ages 5 and up that have a desire to swim at the competitive level. If your child can swim 25-yards freestyle and 25-yards backstroke non-stop, they can participate in this group (25-yards = One Length of the pool). *Mondays and Wednesdays ($50 Members & $60 Non-Members) - Spring Session: March 18th to May 8th and Summer Session: June 10th to July 27th. *Saturdays ($45 MEMBERS & $55 NON-MEMBERS) - Spring Session: March 30th to May 18th. This program is designed for swimmers 10 and under that are not ready for swim team yet, but would like to be in the future. Swimmers entering this group must pass the dolphin group (Level #4-6) or equivalent. *Saturdays - Spring Session: May 30th to May 18th. This USMS masters swimmers group is for adults 18+ who like to compete, swimmers looking for a good workout, triathletes, and those who enjoy the social side of swimming. This group will meet on Tuesdays from 5:30-7 am and Saturdays from 8:30-10 am. Fees for Members are $25 per year or a $5 drop in fee. Non-Members drop in fees are $5 for Seven Hills Residence and $10 for Non-Residence or you can purchase a 10-session punch card for $70. If you have any questions, contact the aquatics supervisor at 216-524-6262 ext. 404 or mgallagher@sevenhillsohio.org. Change-up your workouts at the Pool! This class is a combination of cardio intervals along with strengthening and toning moves. Great for beginners or those with experience ~ a fun time for everyone! Taught by certified instructors around the 4-foot depth. Tuesdays/Thursday from 6-7 pm. Low Impact Water Aerobics: Get a great work-out without the pain! Water Aerobics offers great results while you enjoy the water. Low-Impact, High Intensity! All classes taught by certified instructors - class meets around the 4-foot depth. Monday/Wednesday/Friday 9-9:45 am. This program is specifically geared towards adults with Arthritis. Participants are provided with gentle aquatic activities with the guidance of a certified Arthritis Foundation Instructor. All exercises are low-impact and done around the 4-foot depth. Free to Silver&Fit Members! Monday/Wednesday/Friday 10-10:45 am. Aqua Barre - NEW!! : Aqua Barre is a fitness class that combines all the components of cardio, strength, and flexibility found in ballet barre class with the benefits and fun of aquatic strength and conditioning. Ballet barre combines principles of Ballet, Yoga, Pilates and general calisthenics with a strong emphasis on posture, core strength, and proper technique. Instead of the classic barre and dumbbells, gravity and buoyancy are both used to provide resistance and toning for the lower body, core and upper body. No dance experience is necessary, and modifications can be provided to appeal to both beginners and experienced aquatic enthusiasts! Mondays 7:45-8:45 pm. Have the final say when it comes to enforcing safety rules. May administer a swimming test to any patron at any time. Are required to complete a report for any injury/incident that occurs. Not have food, gum, beverages, or glass containers. Take a thorough shower before entering the water. Not swim with open cuts or wounds or if you have had diarrhea in the past two weeks. Not wear street/tennis shoes on the pool deck. Have children wear a swim diaper if they are not toilet trained. Use only U.S. Coast Guard approved flotation devices. Make sure your child age 5 years and under is within arms-reach. Make sure your child wearing a lifejacket is within arms-reach. Make sure your child age 10 years and younger is accompanied by an adult. Not run, push, participate in horseplay, climb on the play structures, or hang on lane lines. Not dive or flip off the side anywhere in the pool area. Not throw balls during lap/open swim. Not use if under the influence of drugs/alcohol. Not use mermaid tails, scuba tanks, fins*, snorkels*, or inflatable devises. *May be allowed for lap swimming purposes only. Be at least 48 inches tall. Not stand at the bottom of the slide to catch a rider. Ride feet first on their back. Ride one person at a time. Not stop, change positions, or form chains. Not use lifejackets, fins, scuba mask, flotation devices, or throw objects. Observe reasonable time limits (10-15 min.) and exit to cool down before returning. Avoid long exposure and exit if experiencing nausea, dizziness, or fainting. Not enter if pregnant, living with heart disease, diabetes, or high blood pressure. We recommend consulting your physician before use. Not enter if under the influence of alcohol, tranquilizers, or other drugs that cause drowsiness or raise/lower blood pressure. Not use alone and observe a maximum of 8 patrons at one time. Not enter if the water temperature is greater than 104 degrees. Not use with open cuts/wounds or if you have had diarrhea in the past two weeks. We recommend consulting your physician before use. Not add water or put a wet towel on the coals. This is a dry sauna. Not put a wet towel on the thermostat. Avoid prolonged use which may cause nausea, dizziness or fainting. Abide by a 10 minute maximum and leave immediately if feeling faint or dizzy. Not enter if living with heart disease, diabetes, high blood pressure. Not enter if pregnant, elderly, or living with high or low blood pressure. Not enter if the temperature is greater than 170 degrees. Not wear t-shirts, sweatshirts, compression wear or long sleeves. Not use or wear perfume, cologne, or scented lotions/oils. Not apply scent of any type to any part. Not have food, gum, or drinks of any kind. Not smoke, spit, or chew gum. Not shave, groom, or perform manicures. Not bring books or paper of any kind.